Ahlstrom grade 161 is commonly used in Standard Method 2540D and EPA Method 160.2 in place of Whatman grade 934-AH. It is used in general laboratory applications, cell harvesting, liquid scintillation counting, and in the monitoring of air and water pollution. 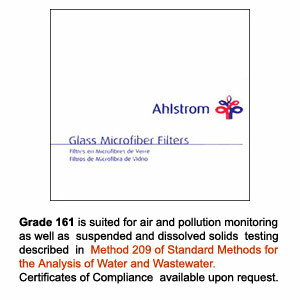 Ahlstrom 161 is generally recommended for water pollution monitoring techniques for total suspended solids. These items will ship in 14 -21 business days. ESP Chemicals Inc. can be your warehouse for stocking orders. Please email us at sales@espchemicals.com for lower prices on bulk quantity.